Germany's answer to the Kindle is reportedly having a lot of success in its first 100 days. Weltbild and Hugendubel, 2 of the retailers that make up the Tolino consortium, put out a press release this morning touting just how great the past 100 days have been. They're pleased to tell you that the Tolino Shine, the new generic 6" ereader that launched with the Tolino platform 100 days ago, has seen sales in the "high five figure range". The press release doesn't get into specifics on the sales figures, but it does note that sales exceeded expectations. The Tolino ebook catalog has also grown in the past 100 days, and it now stocks over 500 thousand titles (up from 300,000 German language titles at launch). As impressive as that might sound, that is a paltry number compared to the 2 million titles that Amazon is showing in the Kindle Store on Amazon.de. And no details were released on how many ebooks were sold or downloaded from Tolino, making me wonder if ebook sales didn't meet expectations. 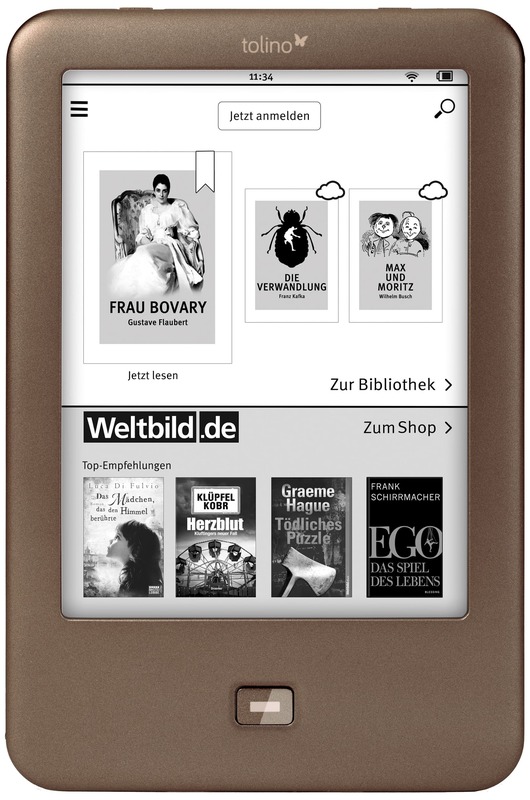 Tolino is a cooperative ebookstore platform supported by 4 German retailers (Thalia, WeltBild, Hugendubel, and Bertelsmann) and Deutche Telekom. The 5 partners sell the Shine ereader in 1,500 retail locations across Germany as well as on their websites, and they also maintain 5 ebookstores with nearly identical content and (thanks to German book pricing laws) nearly identical prices. That's a rather thin press release, isn't it? It makes me wonder if Tolino is really all that successful in absolute terms. We know that the German ebook market was miniscule in 2012 (2.4% of the book market), and we also know that selection is still limited. Just over half of the current releases are available as ebooks, and only around 29% of publishers' backlist. With that in mind there might not be any great news to share for some time. There is no Tolino-ebookstore. When you buy your Tolino from Weltbild it is connected to the Weltbild-ebookstore. When you get it from Thalia, it is connected to the Thalia ebookstore. And so on. But they’re all based on the same platform and draw from the same catalog, right? One could argue that they’re the same ebookstore with different brands slapped on top. In any case, I changed the word from ebookstore to catalog. That word works just as well. No, they are not based on the same platform and they don’t have the same catalogue. Those are booksellers who are competing. And that’s what they said in the first press conference: They will go on to compete. They offer one reading device, but several platforms. After a few months in the market, worldwide sales of the Cool-er (which costs £189 in the UK) have surpassed seven figures, he says. “high 5 figures” in 100 days means 500-1000 a day. Those are typical of a hobbyist/enthusiast market (ala US pre-kindle). Let’s see… 2% of 80M is 1.6Million people reading ebooks. So Tolino has grabbed something like 5% of the market. Let’s see where they stand next summer. It sounds to me that the Shine is an interesting change. Instead of being linked to one proprietary book-store, it is allowing multiple book-vendors to link the shine to their on-line stores. That seems pretty new to me. Plus it’s Germany, and the market is only just starting up there. One thing that concerns me is the quality of the hardware. If it is flaky, it might never recover and the market will be lost. I’m interested in this device because it is Android. As Nook goes under, the only e-ink e-readers are the shine and the Onyx. I own a Kindle and I know that despite its many advantages it is definitely not the e-reader I want. I don’t want the seller to be able to erase the contents I have bought and paid for from the cloud or even from my device, and I strong dislike being a captive customer of Amazon. So, if Tolino allows me to buy what I want, from whatever store I choose, in any language I can read, and become the effective owner of what I purchase, I will be definitely interested.